On our first morning at The Carneros Inn, we had breakfast at the Hilltop Dining Room, which is only open to guests staying on the premises. It's at the top of the property with sweeping views of the Napa hills and vineyards. It was so romantic and majestic...the perfect way to start our day. Here was our view from the table. And once again, the food did not disappoint. 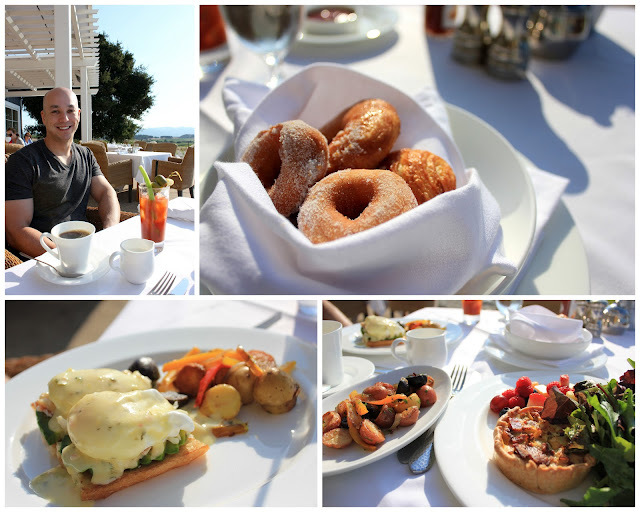 We received complimentary homemade donuts (the Inn is known for these) and pastries to start our meal. Jon ordered the Dungeness Crab Eggs Benedict, and I ordered the quiche with a side of potatoes. Mmm mmm good. We decided to have a very low-key first day and just lounge and relax by the pool until dinner. The Hilltop Pool was only open to people ages 16 and above (there's another larger lap pool on the property for families with children) and the pool allowed no cell phone conversations--needless to say, it was so peaceful. They had a staff devoted specifically to everyone poolside that would get you whatever you needed-- food, drinks from the bar, etc. Seriously how can you not love this view? When we arrived to the pool each day, we were given a bucket of customized Carneros Inn water bottles and poolside menus. 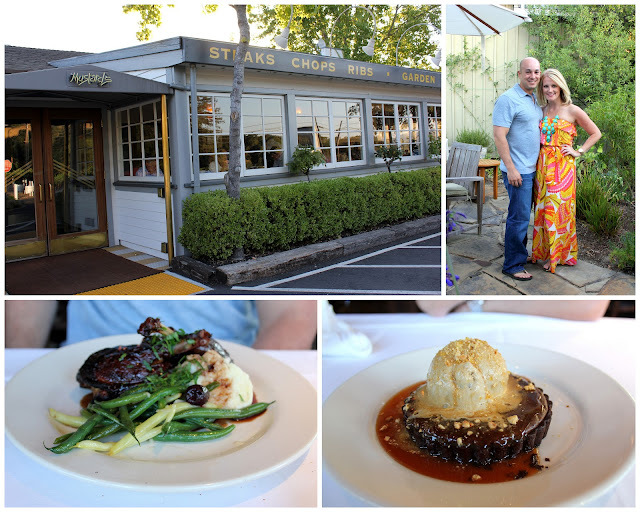 After hours of relaxation and reading by the pool, we got ready and headed to our dinner reservation at Mustard's Grill just up the road in Yountville. This particular restaurant was recommended to us by multiple people, so we knew it was one we had to try it out. I ordered a penne chicken pasta (not pictured) and Jon ordered the tea-smoked Peking Duck. We finished off our meal with their delicious Warm Chocolate Hazelnut Truffle Tart. Everything was superb!